We believe that individuals, neighborhoods, communities and society are not thriving to their full potential in core aspects of humanity – physical health, mental health, spiritual health, economic health, intellectual health, environmental health, and emotional health. The world’s recent emphasis on sustainability has moved us to a fixed mindset of enduring and surviving at the cost of ignoring our human aspiration to thrive, create learn, and grow in our uniqueness. The emerging concept of generativity can help us overcome this. As individuals, neighborhoods, communities, and society, generativity enables us to thrive in our fullest potential. When we live in communion with others, we can create and innovate in service to each other so that we may fully achieve our potential. Consider yourself as an acorn; encoded within your possibility is the most amazing unique oak tree. 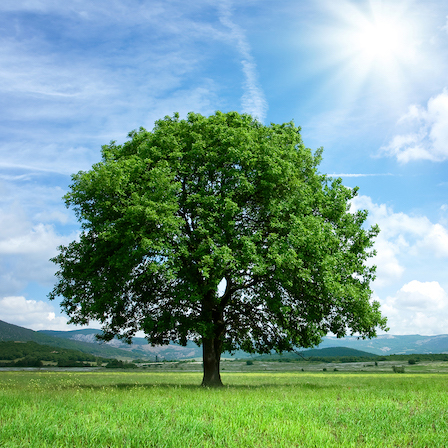 The conditions of the sun, soil, air, and water combined with the self-resonance of your unique calling will determine whether you are a flourishing oak tree or a runty little twig. These conditions strongly influence both our individual and collective capacity. How we cultivate this cultural soil is key to enabling generativity. And this soil is grounded in a set of principles/truths that guide us. What’s intriguing is that generativity cannot happen with individuals independently. The water that nourishes each of our unique acorns is in our relationship with others. By convening, narrating, and relating to each other, we can thrive and create a generative world. • and throughout aspects of our well-being – physical health, mental health, spiritual health, economic health, intellectual health, and emotional health. We are beginning to question whether the community problems we address must be “solved” (using adaptable problem solving) or if they can be “dissolved” by focusing on generativity itself. Reflecting alongside a river, one can observe whirlpools and eddies that create a recurring pattern within the river as it flows downstream. Are these eddies solvable by working on the eddy itself or “dissolvable” by improving the generative flow of the river? Let’s cultivate the conditions for a generative world and find out together. To go (much) deeper and help us refine the model, please contact us and become part of our growing network. Special thanks to Ted Toussaint, Mike Sandercock, and Kevin Florey for editing and clarifying this content. Good powerful analogies of acorn/oak tree and river/eddies to illustrate Generativity. Taking the river/eddies analogy a little further, to eliminate or minimize the eddies, we have to streamline the river flow (less turbulence, smooth flow) and also smooth out the local riverbed to not nucleate eddies. Thus we have to do both; individual problems addressed & solved as well as promote Generativity so that the problems also dissolves.